Welcome to the Minchin Lab in the Department of Biological Sciences at Southern Illinois University Edwardsville. Our research focuses on community ecology, conservation biology, and restoration ecology. We use a combination of computer modeling, field observations, and experiments to address both theoretical and applied research questions in these areas. Two major themes are the development and evaluation of new statistical tools to analyze community variation in space and time and the application of these and traditional methods to applied research questions in conservation and restoration. 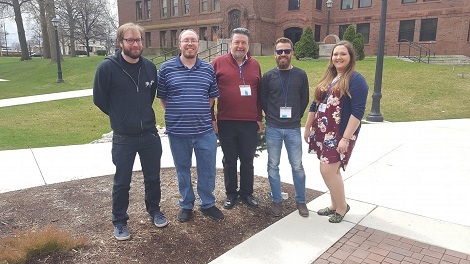 Members of the Minchin Lab at the annual conference of the Illinois State Academy of Sciences, 2018, which was held at Millikin University, Decatur, IL. From left: Miles Gossett, Chris Featherstone, Dr. Peter Minchin, Dillan Laaker, Kassie Karssen. Kassie and Dillan won first and second prizes for their oral presentations in the Zoology section.